Get ready to supplement your regimen of morning internet cuteness with charming raccoon Fedor. More than 14,000 followers swear to it on Instagram, where Fedor’s Moscow owner records his daily shenanigans. Russia’s latest Instagram sensation draws crowds from across the world, who love to watch Fedor steal stuff, break precious belongings and duke it out with the cat every day, the two appearing to be polar opposites. 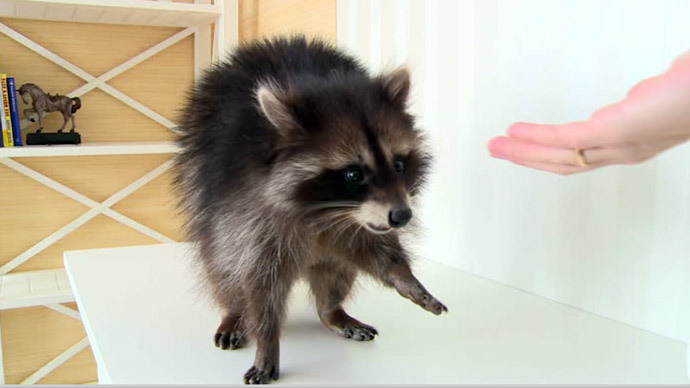 “A raccoon is not like a cat or a dog. It is hyperactive and very interested in everything. For me it’s something in between a bear and a mouse, especially when it’s still a baby,” owner and animal lover Anna told RT. Despite the seeming inability to imagine life without him, it’s a constant day-to-day struggle to contain the wild animal, which is inclined toward thieving things, sleeping and begging for food. Fedor’s secret weapon seems to be looking straight into the camera. That’s how he hypnotizes us to bend to his every whim. Anna says that after watching the latest fantasy action blockbuster Guardians of the Galaxy, which features Rocket – a wisecracking raccoon wielding heavy weaponry – she’s even prouder to have Fedor by her side.